Implements a multi-level panel menu which can be opened by hovering over a small sidebar. Besides the standard links there is also a dedicated section for social icons. 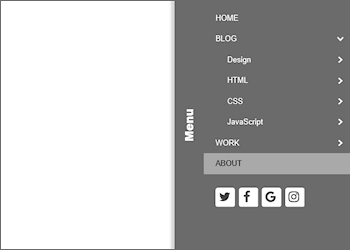 Unlike other panel menus which are usually triggered by a hamburger button, this menu displays a vertical bar at the left or right side of the page. Moving the mouse over the bar will expand the menu. This extension is also part of the Navigation Extensions Pack - Volume 3 which includes 9 commercials menu extensions for only $24.95!